Do all of your recipes that you prepare turn out perfectly each and every time? Have you ever made a new recipe that bombed and you were left utterly disappointed? Well I know that this has happened to me that’s for sure! Here’s a low-down on my recent kitchen catastrophe: Mr. Bill wanted something sweet and found that all the cupboards were bare! So I decided to bake a humungus sour cream chocolate bundt cake that I had never made before. I followed the directions exactly, even baking the cake longer because it seemed a little ‘jiggly’ after the required baking time was over. 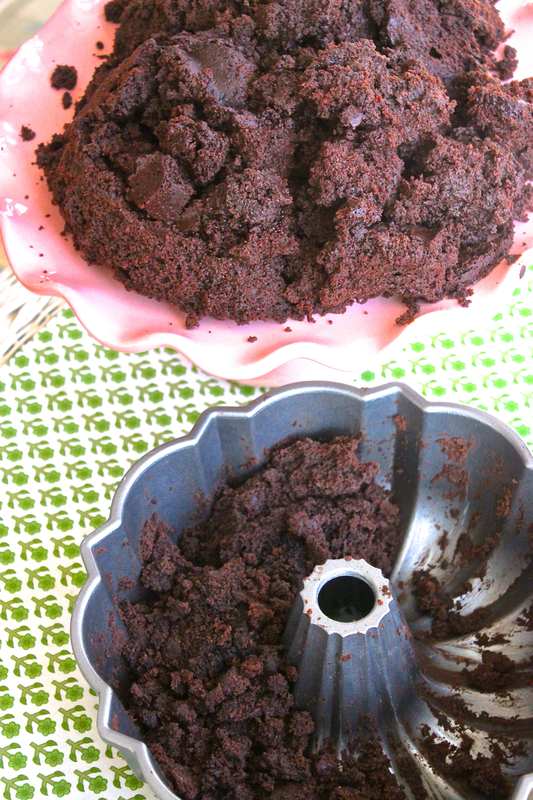 Upon cooling and inverting the monster bundt cake, it came out in CHUNKS, CUBES, and CRUMBS! Truthfully it resembled what we find in piles in our acreage pastures! With half of the cake still in the pan, I had to spoon out the rest! It was such a major BUMMER! I hated to toss out the cake since it was super moist and rich. I had some heavy whipping cream and fresh red raspberries already in my frig . . . so with that, a wonderful ‘A HA’ moment popped into my brain! Or how about some Mini-Trifles! 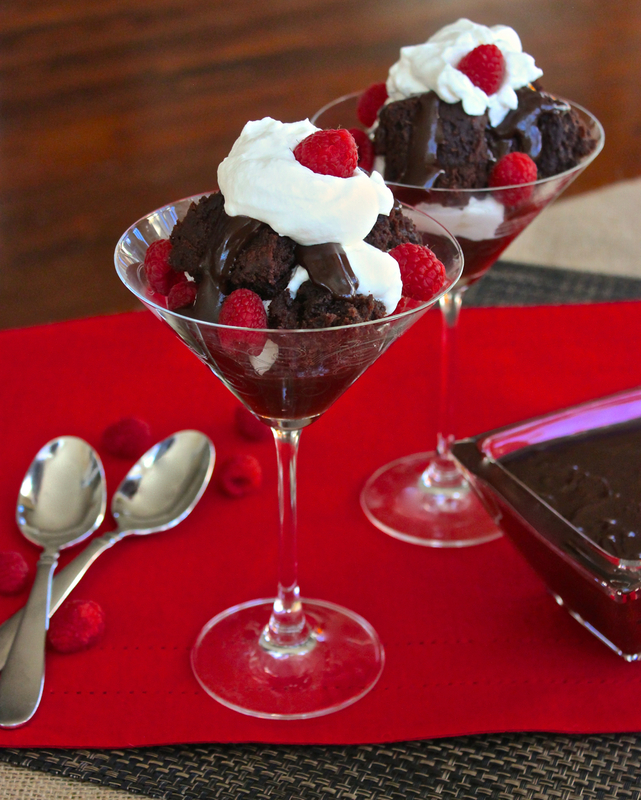 Chocolate Trifles with Raspberries and Chocolate Ganache in Martini Glasses were created! Top with freshly whipped cream and . . .
Wah-LA! Disaster fixed into success! Dessert is served! 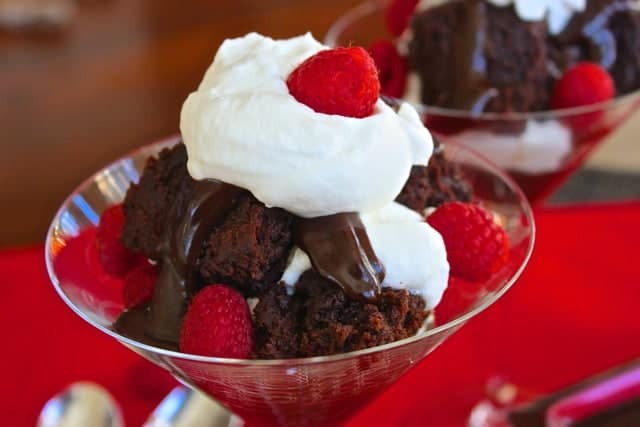 Chunks of rich, moist chocolate cake, mingle with fresh raspberries, chocolate ganache and whipped cream . . . DISASTER AVOIDED! These wonderful little martini glass mini-trifles can also be made with one of your favorite chocolate cake recipes. In pretty parfait or martini glasses, spoon several tablespoons of chocolate ganache in the bottom of each glass (recipe below). Place several chunks of chocolate cake over the ganache. Whip up some heavy cream (about 2 cups) with sugar added to your preference. Layer some whipped cream on top of the cake pieces. Place a few fresh red raspberries randomly in the glasses. Layer a few more chunks of chocolate cake. Garnish the top with whipped cream and raspberries. dig into the delicious results of a baking blunder! In a glass mixing bowl, combine the chocolate and butter. Either melt for 1 – 2 minutes in a microwave or place the bowl over a small pan of boiling water to melt the chocolate. Pour in the cream and whisk all the ingredients until completely melted, blended and smooth. Thank you so much Karen for such a kind compliment! I hope that you are enjoying your summer! Wow, you saved the day and created a delicious dessert. I wouldn’t mind diving into some of that right now. Grazie mille Linda for your lovely compliment! What a great save!!!! Personally, I prefer the trifle over the bundt cake any day. 🙂 I would definitely be licking the class once one. quite clever and delicious! It was a stroke of crisis and ‘what can I do with this mess’ MJ! I guess my brain kicked in at the right moment! Thanks for your kind comment! Thanks for you kind comment Betty! Hope you’re doing well this summer! Thanks for your comment here Larry! I’ll be over to see what you and Bev have been cooking up lately! I think it is wonderful to share honesty with all of our cooking endeavors too, Lea Ann. So big kudos to you for also sharing boo-boos (although very few in number, I’m sure) along with your super wonderful recipes! I don’t see any cake failure but a perfectly perfect dessert, Roz. You are always so sweet Angie and reading your comments always makes me smile! What a wonderful way to put into words how this recipe was transformed Katie! well, I see no blunder here. That looks beautiful, and I want some@ Brava, Roz! Oh Roz, we LOVE anything with the word Trifles in it!! This looks so beautiful!! – And we know what you mean – not to let a good thing go to waste. A great mind such as yours always thinks out of the box! Good job Roz! Grazie mille Anna and Lisa! I always appreciate your visits and comments here! I literally gasped when I first saw the picture of your trifle because it looked so delicious and decadent! I was amazed to read it started out as a mistake. It sure didn’t end up that way. Thanks for your honesty in sharing the problems. It makes us all feel better knowing we aren’t the only ones whose recipes don’t always turn out. By the way, I am excited to try out your ganache recipe. I have a recipe for ganache that I like, but it isn’t very sweet, and I noticed yours has sugar in it. 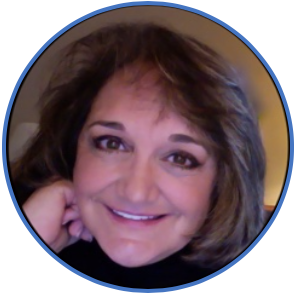 Thank you, Roz! You’re so welcome Shari! The ganache is a good one that can be used for so many desserts. Enjoy! Looks yummy. I know I’ve made a few “Cheesecake Crumble Cups” when things haven’t worked out for me. What a great idea too Amy! Thanks for your visit and I’ll stop by to see what you’ve been cooking up lately! Man… what a wonderfull disaster. Thanks for your kind comment! Wow Belgium certainly has a great soccer team. Congrats on the win yesterday. Oh Roz, you took a bummer cake and turned it into something very lovely! There was no need to even tell on yourself (smile). You’re just one of the most amazingly kind people, Velva! This was one recipe that I was able to salvage, but I’m not always this lucky! LOVE love love TRIFLES!! 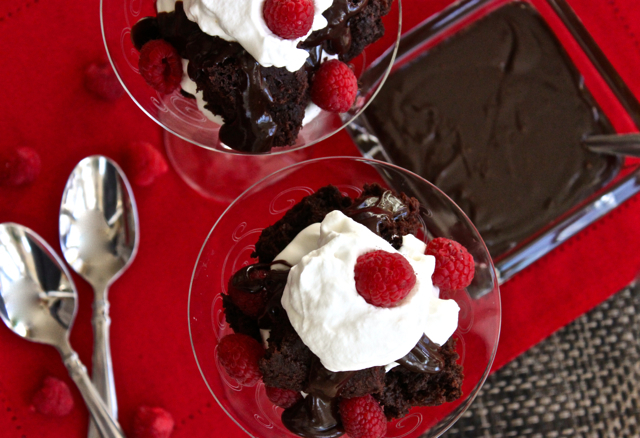 and this one is so decadent and super easy! Great recipe Roz!! Thanks you two! Trifles always look so festive and the secret is that they are SO EASY!